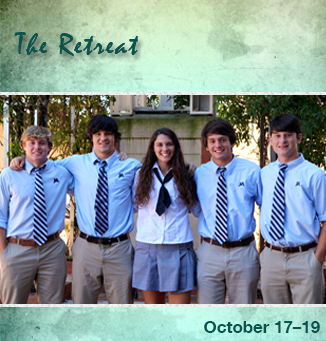 The Retreat is a student-organized Christian weekend revival on Oct. 17-19 for grades 7-12 that will be held on our campus and planned by our students. The weekend will focus on “purpose” with sessions led by David Hederman and worship times led by Rich Price. Senior class members will facilitate group discussions and seminars to expand on the topic. There will also be games and sports. Students will stay in host homes by grade and gender. Parents interested in providing host homes can contact jaretreat@gmail.com or ppratt@jacksonacademy.org. All students received a registration form. Early registration is $30 through Sept 30. This includes 3 meals, a t-shirt and all activities. Student leaders include Luke Ross, Josh Hinkle, Allie King, John Sharp Kirk, and Steven Irby. Click here to view the JA Retreat registration form.